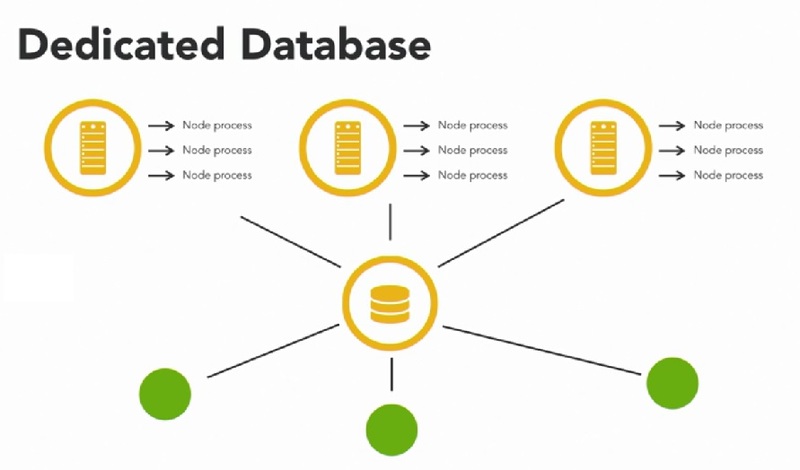 Scaling Node.js applications across instances, the need for a database arises. When we have multiple instances of the same process cloned, they need to act on the same data, but the memory used by each instance is not shared. When we create our change data on a single instance using memory, that data is not automatically shared across all of your processes. The easiest way to synchronize and share data across all of your processes, is by using a database. A database provides a single access point to store data. If all of your instances communicate with the same database, then they all should have the correct data. There are a lot of databases out there that you can implement. The choices range from reliable open-source projects to large enterprise databases that have been around for decades. As a Node.js developer, it is important that you learn to use a database and start incorporating it in your projects early so that they are ready to scale. It's most likely not enough to simply install a database on the same machine that you're using to host your application. Remember, as we scale, we will be scaling across different machines. All of your instance will need to have access to up-to-date, accurate data, so it's important that you use a dedicated database service that is accessible by all of your instances. As you scale your application, we can also scale our database service and make it capable of handling more traffic and data. We can also use third party database services like Aws Appsync, mLab , firebase . These services will charge you a monthly fee based upon your traffic and data. Scaling is already baked into these services. Most services provide an easy solution to scale your database cluster or partition data.